Hundreds of anti-austerity campaigners are expected to gather outside the headquarters of RTE, Ireland's national broadcaster, on Saturday to protest against what they say is biased reporting that represents the interests of a marginal elite. Protesters will assemble at 1pm at the Sacred Heart Church in Donnybrook, south Dublin, before making their way to the broadcaster’s studios nearby. The demonstration has been organized by a diverse group of anti-austerity and political campaign groups from far-flung regions across Ireland. Among these, are anti-water charges campaign groups that have protested regularly in recent months against the Irish government’s water taxation policy shift. The water tax forms part of the government's long-term plan to repay billions of socialized bank debt, stemming from a banking crisis that brought Ireland's economy to its knees. Following an IMF/EU bailout in 2010 that resulted in years of harsh austerity measures, Ireland's economy is yet to fully recover. Campaigners say RTE’s representation is failing the wider Irish populace, and has concealed some of the darkest manifestations of austerity to have befallen the Irish state since 2008. They accuse the station of portraying Ireland as a nation in recovery when in reality unemployment remains stubbornly high, suicide rates are soaring, and families who have bailed out corrupt bankers are being evicted from their homes and forced onto the street. They also warn of political policing in Ireland, whereby anti-austerity activists are being arrested for exercising their democratic right to protest. Paul Cheevers, a leading organizer of Saturday’s protest, says the Irish people refuse to continue “to be fooled” by RTE’s representation. The Dublin-based personal trainer and father-of-two is calling upon the broadcaster to question establishment sources, and refrain from peddling inaccuracies. In recent months, he has actively resisted the installation of water meters in Rialto, Dublin, along with other local activists. The Irish government, in tandem with semi-state firm Irish Water, will use the meters to facilitate the charging of citizens for water usage. Opposition TDs (MPs) and campaigners say the imposition of this veiled austerity tax has spawned the largest protest movement Ireland has seen in decades. But protesters central to this movement have been misrepresented by RTE, with peaceful campaigners being portrayed as “malicious and dangerous,” Cheevers says. At the same time, the grueling impact of austerity on the ground in Ireland is underreported, he argues. “Suicide is in overdrive yet the media don’t mention why this is happening, our hospitals are lacking beds, people have been stripped of their medication and the government message is: you look after yourself,” he said. “I don’t see recovery, no one I know is experiencing recovery. The media will tell you we are in a recovery. It’s not true,” he added. “Minor acts of civil disobedience such as picketing have been framed as violent acts,” he said. He said this trend is not always apparent. However, he stressed "whenever any serious class issue comes to the fore any pretence of pluralism goes out the window." Another leading organizer of Saturday’s demonstration is technical sales representative and father-of-three Michael McDermott. He is particularly active in regional anti-water charges campaign group Cavan Says No To Water Charges. The anti-austerity campaigner criticized RTE’s coverage of Ireland’s anti-water charges movement as biased. He said the broadcaster ignored a large protest in December 2014 attended by 3,000 campaigners opposed to the Irish government’s water taxation policy, yet reported on a far smaller rally in North West Ireland on the same day. McDermott stressed anti-austerity protesters in Ireland have been unjustly demonized by RTE. He said the human cost of austerity is underreported in Ireland, and Irish citizens’ reliance on soup kitchens and food banks is largely ignored by the government-owned broadcaster. “On Wednesday night I attended the first meeting of our community coming together to help open a food bank because we have families contacting us that can’t afford food. We don’t see this reported,” he said. Reflecting on Ireland's economic climate, McDermott said the state's supposed economic recovery is largely a myth perpetuated by RTE and other domestic media outlets. “There has been no recovery for the majority of people in Ireland. I work hard and at the end of the month have nothing,” he said. McDermott stressed thousands of Irish families face losing their homes because they are out of work and simply can’t afford their mortgage repayments. “The prospect of losing your home, the place where your family should be safe from harm is one that puts people into a very dark place,” he said. Saturday’s demonstration is one of many recent protests in Ireland, as citizens continue to battle against austerity and economic stagnation. 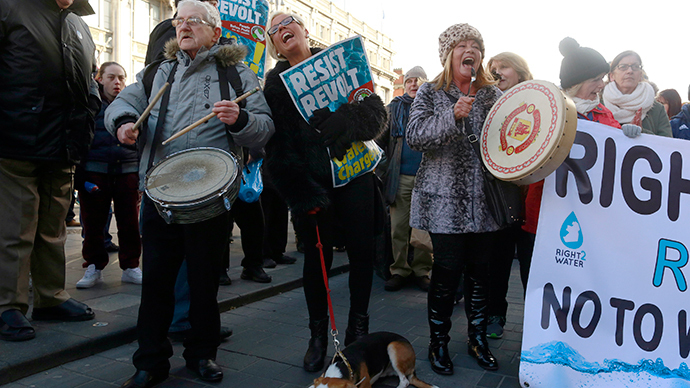 An estimated one hundred thousand people took to the streets of Dublin in December in protest against the Irish government's water charges. As austerity prevails and unemployment, poverty, and homelessness remain rife in Ireland, campaigners’ calls for socio-political reform are gaining momentum.